Photo of the St. Louis Central HO scale model railroad at the Missouri History Museum. 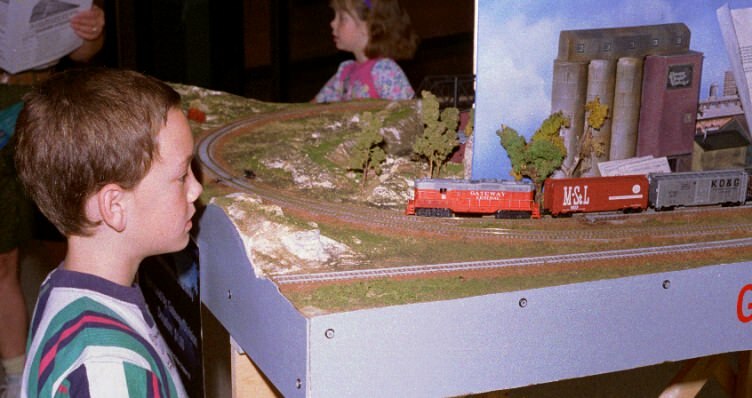 For over a decade, the Gateway Division has constructed small model train layouts for display and demonstrations at local train shows. 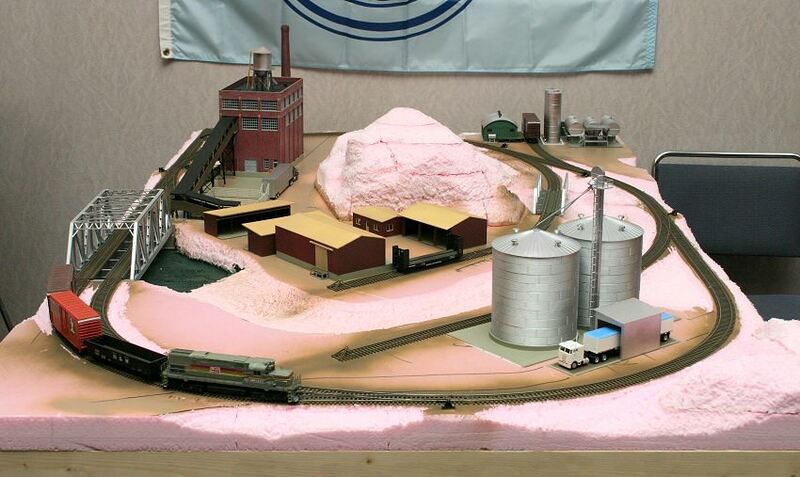 One of our exciting projects was the construction of a custom 4’x8′ model railroad for the Missouri History Museum. This layout was displayed in their exhibit, “Our World in Miniature” during the Winter of 2003. You can click this photo to go to the start of the over 100 photos of this layout, and each of its structures. A number of the buildings have articles or tips on how to assemble that specific model kit. 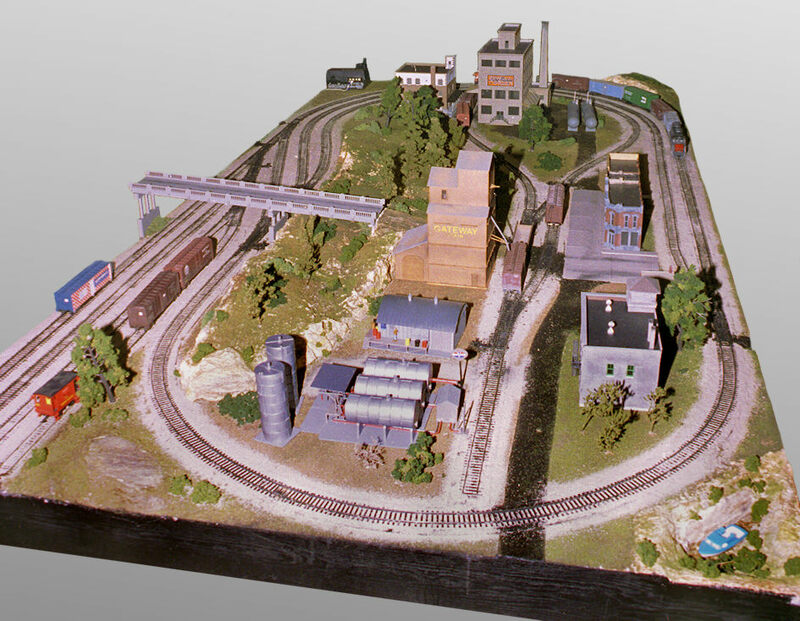 One of our favorite project railroads was the Gateway Central VI layout. It was designed around two logging industry scenes (one on each side of the layout). This side shows the paper and kraft mills with a wood chip unloading area. Life-Like Power-Loc nickel-silver track was used for this specific layout. Our project railroads have used a variety of different materials and techniques. Different past layouts have used Atlas Code 100 and Code 83, Peco, Micro Engineering, Life-Like Power Loc, Kato Unitrack, and Bachman track and turnouts. We use an assortment of structures from a variety of manufacturers on each layout. All these layouts were designed to be transportable. Gateway Central VI Packed And Ready to Go. Most of our project railroads have been designed to be transported in normal-size mini-vans and SUVs. Some of the layouts divided into two or three sections, some designed to stack one on top of the other. However, the easiest project railroads to transport are single units 4 feet by 5 feet 10 inches. This is the largest size that fits flat in standard mini-vans and SUVs. The Gateway Central VIII (2001), IX (2002) and X (2003) layouts were designed this size, and had all structures permanently epoxyed to the layout (making the layout quicker to move, and with less damage to the structures). Click a photo below to see the enlarged, more detailed photo or more information on that Gateway Division project layout. Chairmen for each project layout are listed. Photos by Richard Schumacher. This is purely a switching layout and doesn’t have a continuous running option. 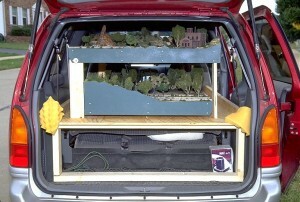 We built it to display at train shows. It’s also the smallest project railroad we’ve ever done. Article on this railroad and how it was designed. Article on this layout’s buildings. Track plan and parts list to construct a home version of this layout. 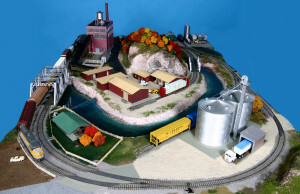 This 4×7-foot layout features continuous running and two industry switching areas: a cement plant and a manufacturing plant. Click the photo to view an enlarged version. Articles with photos of this layout, and its structures, will be added here soon. This 4×7-foot layout features continuous running and a number of industries to switch. Click the photo to view an enlarged version. Articles with photos of this layout, and its structures, will also be added here soon. See the photo of this layout under construction. 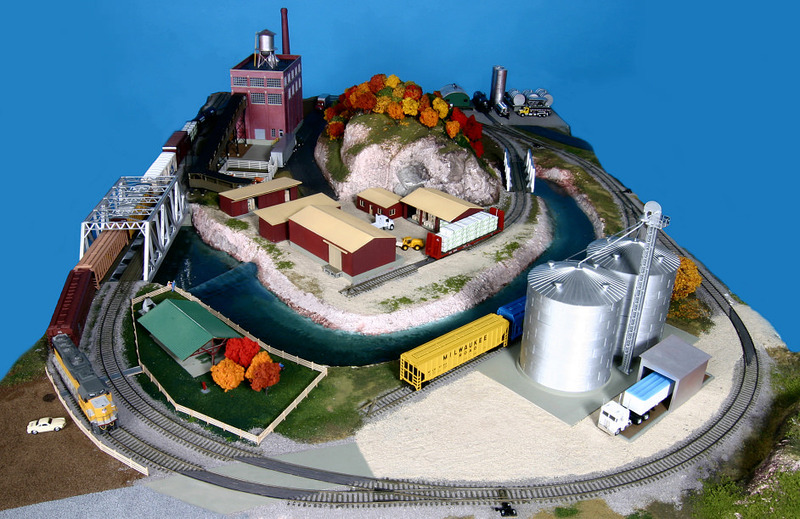 Riverport harbor switching, train operation action, and a continuous run in only 4’x7′. The (non-operating) lift bridge was built with Atlas bridge components. Article and photos on this railroad. Photos of the lift bridge and grain elevator. Photos of the harbor scene and structures. N scale lightweight, small model railroad – built on a 30×80-inch door! N also allowed big time, double track railroading in a small space. The scenery represents the upper midwest with a double track tunnel, several through truss bridges and a typical river town with its “Turn of the Century” brick buildings. Read more about this railroad. 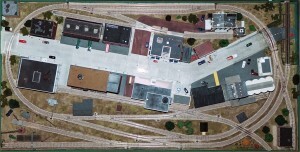 A minimum-size 4×6-foot HO railroad offering switching and train operation action, while still providing a complete mainline loop for just running trains. This layout can be easily expanded in two different directions. 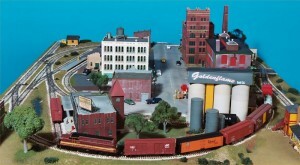 The tall city structures divide the railroad into separate operating scenes. View of photo tour of this railroad. Read how the plan was designed. See the buildings on this railroad (part 1). See even more buildings on this layout (part 2). The “St. Louis Central 2002” 4×8-foot operating train layout was part of an exhibit on models and miniatures at the Missouri History Museum in Forest Park October 5, 2002 to January 21, 2003. View photos of this railroad. See the placement of the 26 buildings and structures. 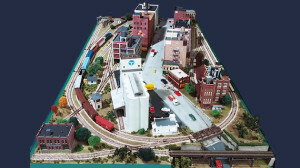 View the buildings on this layout (part 1). View the buildings on this layout (part 2). 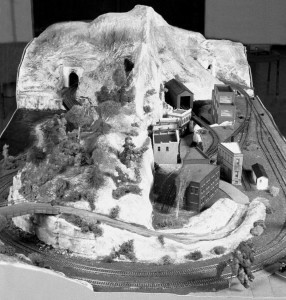 View the buildings on this layout (part 3). Read about the construction techniques used. The facing and trailing point sidings, and three crossings, give a “big time railroading” feel in only 4′x6′. This minimum-size HO track plan features continuous running, switching operations, and can be easily expanded in four different directions. View a photo tour of this railroad. The buildings on this layout (part 1). The buildings on this layout (part 2). 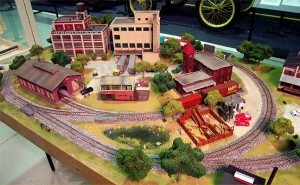 Constructed during the 2001 National Train Show (July 13-15). Photos of this layout being built in three days at the national train show. Track plan and donations to this project. This layout is 3’10″ by 5’9″. It is designed to fit in all standard size mini-vans and SUVs as one piece. All of the structures are attached with epoxy to the layout, making it easier to move. We used Life-Like Power Loc “train set” track on this railroad (similar track is available from Bachmann). An important consideration is this type of track raises the height of the rails, and you’ll need to raise structures with loading docks (or openings for cars or locomotives) to match. This is about the minimum size layout you can design in HO scale to run standard engines and cars and still have a continuous running loop. See photos of this layout. 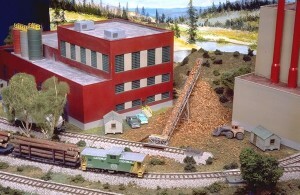 This layout was designed around two logging industry scenes (one on each side of the layout). One side has paper and kraft mills with a chip unloading area. 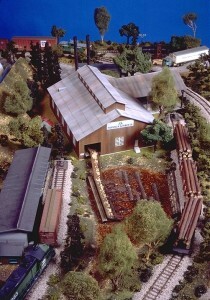 A sawmill and mill pond scene with a cut lumber loading area is on the other side of an extruded foamboard scenic divider. 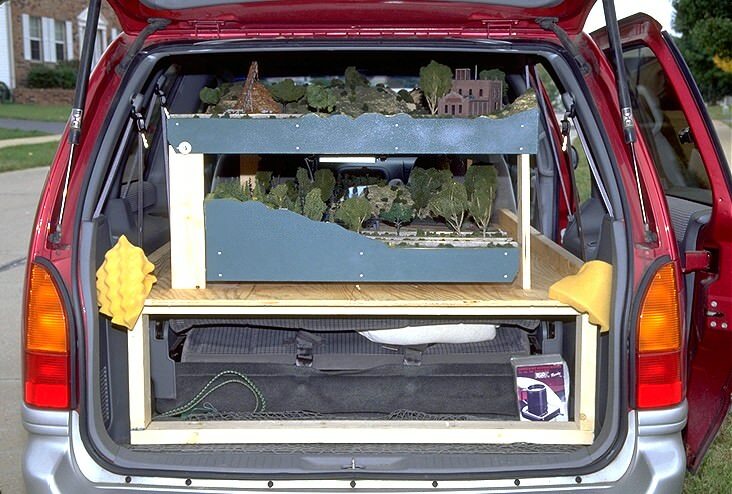 The layout was designed in two sections that stack on top of each other so it would still fit inside a minivan, but allowing deeper layout scenes. It even took a trip to the 1999 NMRA National Convention! 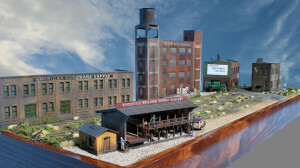 Read about this great model railroad. Videos on how to build the WGH layout. Read the article on this railroad any why we do project railroads. The ever-popular “up and over” figure-eight layout is given a new twist. Mountains carved out of extruded styrofoam sheets impressively frame our “Ozark River” valley while keeping this a lightweight, easy-to-transport railroad. The carved foam was painted with earth-color latex house paint and sprinkled with green and brown scenery foams while still wet. 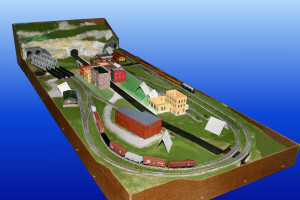 A small yard and a coal mine in the valley provide switching spots for this single-direction layout (there’s no passing siding to do run-arounds). The beautiful Central Valley truss bridge crosses the river in the center of the railroad, while a scratchbuilt timber trestle crosses it further upstream. Plan available in the December 1995 Model Railroader magazine.